Champion Sports is excited to offer you our exclusive deluxe badminton travel set. 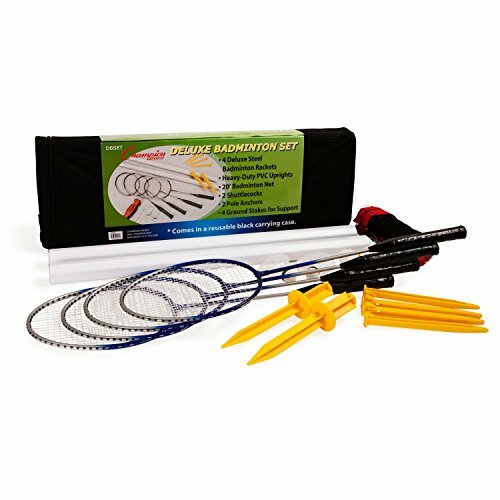 This high quality 15 piece game set includes everything you need to quickly setup and start enjoying the classic and competitive game of badminton. Set includes 4 rackets, 2 shuttlecocks, regulation game net, plastic poles and posts for secure and easy setup. Take this portable set with you anywhere to enjoy a backyard badminton game or competitive match at your local park, school, or even at the beach. Badminton is a great cardio workout for anyone looking to improve their overall fitness and activity level and can be enjoyed by players of all ages and skill levels. Great for birthday and pool parties, tailgating, family reunions summer barbeques and picnics; Badminton is the perfect lawn game for kids teens and families looking to enjoy the outdoors while engaging in friendly competition. This easy to install instant badminton court goes with you anywhere, pack in the car for trips to the beach or for a fun game to play during birthday parties or long summer days. Custom Nylon and zipper case securely houses everything you need and is perfect for storage in the garage or attic. Set includes durable slim aluminum racquets and weather resistant 20 inch nylon net with 2 sweet spot birdies and 4 sturdy ground stakes to ensure a secure hold even in high winds. Net is quick and easy to assemble and comes with everything you need to set up an outdoor badminton court in just minutes.